~ James J. Lee, in the manifesto he leaves behind. SILVER SPRING, Maryland (Discovery Channel Headquarters) — Today, America has lost a hero. James J. Lee, a revolutionary for the cause of the earth, was gunned down at 4:48 PM ET by fascist pigs in an act of severe police brutality. A pioneer in the movement to expose people for the filth they are, James J. Lee was a controversial figure. As a result, many unfounded accusations have sprung forth about him in relation to today's incident. 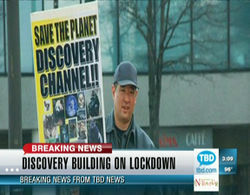 Lee supposedly "took several hostages at gunpoint at the Discovery Channel headquarters earlier today." However, the truth about him is much more touching. He was a strong advocate for sterilization, and other methods of restoring our climate. After an epiphany left him with the realization that having babies leads to war, Lee started his anti-infant crusade. This led him to take a very active role in trying to reshape our planet to the perfection that was. In February 2008, he was arrested at the same location for staging a very civil, peaceful demonstration in the name of Mother Earth. This resulted in Lee being forbidden from coming within 500 feet of the Discovery Headquarters. He leaves behind a manifesto of his wisdom, so that further may choose to follow his example, and fight those who would fight Mother Earth. Mourners wishing to give their final respects from all across the globe will be attending his funeral: The Lions, Tigers, Bears, Giraffes, Elephants, Froggies, Turtles, Apes, Raccoons, Beetles, Ants, Sharks, Bears (again), and, of course, the Squirrels. This article was nominated to become a featured article; however, due to several votes being devoured by a Mushpang, it didn't make the cut (19/11). Don't let this happen again! For just pennies a day, you can prevent another travesty of this nature, or vote for other articles at Uncyclopedia:VFH. This page was last edited on 10 January 2013, at 22:43.